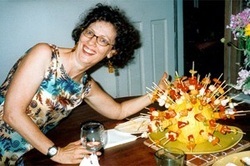 A few years ago Mary Logue and I threw a cocktail party for all the mystery writers in the Twin Cities area. It was supposed to be an outdoor party, but a huge thunderstorm moved in, so we had about fifty people (Minnesota has a lot of mystery writers) jammed into our house. It was fun!